May is over and in this post we are looking back to what we achieved, on a very busy month in terms of the project development. During May we also run our “Energy Wednesdays” informative segments, where we focused on various aspects of the energy markets, which we think are important insights regarding the operation of the energy sector and that we think everyone should know. The following sections provide a summary of all highlights for the past month. Enjoy! – The first METRON installation in Madrid in San Fernando public market. – Announcement of new collaboration agreement for the integration of Pylon Network’s blockchain code, with eGEO smart meters. – Listing on QIEX exchange. PYLNT paired with ETH and USDT. – How the price of electricity is affected by the so-called “energy mix”? – Choosing your electricity provider in the EU liberalized utility market – the Spanish case. – Looking into the Spanish energy market: an analysis of the stakeholders and their interactions. – Achieved milestone up-to-date and planning the next steps. 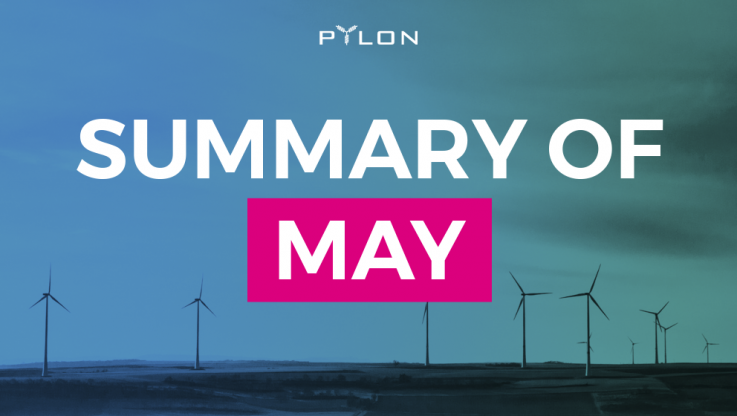 – Pylon Network’s confirmed events for June. With the closure of this intensive month we are getting ready for June, which as you read, will be a busy month as well. Stay tuned to follow the developments of Pylon Network and the exciting news coming up!